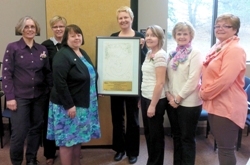 Congratulations to Perth District Health Unit – now designated as a Baby Friendly organization! The Perth District Health Unit was recently presented with a plaque, commemorating their designation as a Baby Friendly organization. We congratulate them on this important achievement. Pictured L-R: Renate Van Dorp, Nancy Summers, Marg LaSalle (Breastfeeding Committee of Canada), Dr. Miriam Klassen, Heather Kane, Glenda Blair and Tina Feltz.